The Torino series by Forno Venetzia offers an authentic Italian wood-fired pizza experience and robust features to meet the demands of entertaining larger gatherings of friends and family. The Italian-designed and engineered Torino 200 countertop wood-fired pizza oven has a generous 32 x 24-inch cooking surface capable of handling up to 4 pizzas or multiple dishes at once. The fire brick hearth is lined with double-layered ceramic insulation for excellent heat-retention and superior cooking performance. The oven dome features a durable, UV-resistant powder coat finish to help prevent color fading year-round and is complemented by a signature Forno Venetzia chimney cap and oak oven door handle. A thermometer built into the oven face lets you keep track of internal oven temperatures, making it easier to learn how to adjust cooking temperatures using the oven door. A glass oven door window allows you to view food while cooking. This Torino 200 pizza oven has a copper dome finish and is shipped fully assembled & ready to use, no curing required! 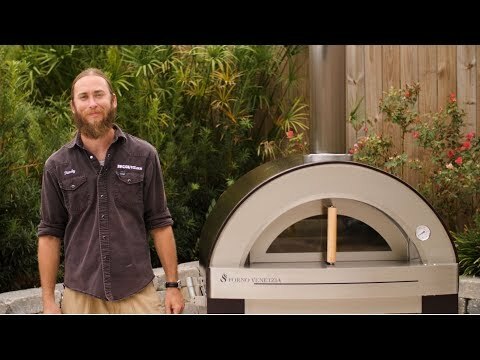 This is my first high end pizza oven. Very easy to use in order to get professional results. Had been using the UNNi pizza oven which is very finicky and hard to keep constant temp. The oven is extremely well made but be sure to have at least 3 people to help move into position. I made my own cart to save money. What does this need to be mounted on? Cinder block? Other surfaces? The owner's manual advises placing this oven on a flat even surface away from combustible materials. Stone or concrete is ideal. Is the surface of this oven cold to the touch when it is in use or does it heat it. If so how much. Apparently the more expensive version with the same dimensions does not heat up on the surface. Also can you compare and contrast the $3000 version with this one? What di I get in the more expensive version that this doesn't provide? Thanks. Hi, Gary. It seems like you're looking at the Forno Venetzia Torino 200 and the Forno Venetzia Torino 500 pizza ovens. If so, both pizza ovens are insulated, but can still get hot on the outside surface, and it's recommended to use to wood handle when handling the oven to avoid burns. Functionally, these pizza ovens work in the same way, but the Torino 500 pizza oven includes a cart with shelves, which gives it a higher price.